Presidential Pets: The Weird, Wacky, Little, Big, Scary, Strange Animals That Have Lived in the White House by Julia Moberg. Review: Have you ever read a book with an amazing start, one that has an opening that draws you into the book? Well, in Presidential Pets by Julia Moberg, it does just that. It makes me want to read more immediately. But then, when I turn the page, I am not too impressed. Only one-fourth of the page has cute, fun, little facts about the pets. The rest of the page contains statistics, accomplishments, and facts about the presidents' lives and terms. A small bullet list of other information completes the page. 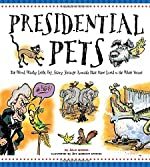 Based on the title, Presidential Pets is expected to be a book about all of the pets of our previous presidents (George Washington through Barack Obama). But, it contains facts about the presidents' terms and their lives. This book is better for getting some facts for a research project rather than learning about pets. Presidential Pets will appeal to people who are interested in the accomplishments of presidents more than people seeking fun facts about pets. I prefer the author's fun, Dr. Seuss - like wording that she uses to begin the story. It is a fun, engaging, interesting style that has readers laughing and enjoying the book. This fun style is contrasted with awkward sayings such as, ÒMany called him Walrus for his mustache silhouette and despite his animal nickname, Chester Arthur did not own any pets.Ó Ms. Moberg also includes other interesting quotes that have little to do with presidential pets. For example, one quote is about Ronald Reagan and Jelly-Belly jelly beans. However, even though I am not a fan of this book, I do think that the illustrator, Jeff Albrecht Studios, is an amazing artist. The illustrations are greatly detailed, comical, and overall impressive. This book does not live up to the expectations set from looking at the cover. But, when read for the right purpose, it is interesting. Unfortunately, I give Presidential Pets two stars for being inconsistent. Review written by Allie (6th grade student). We would like to thank Charlesbridge Press for providing a copy of Presidential Pets: The Weird, Wacky, Little, Big, Scary, Strange Animals That Have Lived in the White House for this review. Have you read Presidential Pets: The Weird, Wacky, Little, Big, Scary, Strange Animals That Have Lived in the White House? How would you rate it?